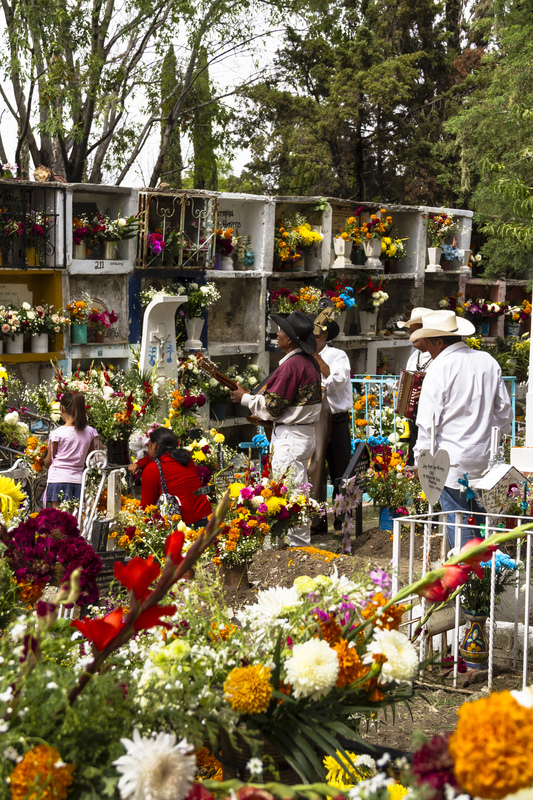 The Mexican people do mourn death as well as celebrate it, but consider the way in which that is done. 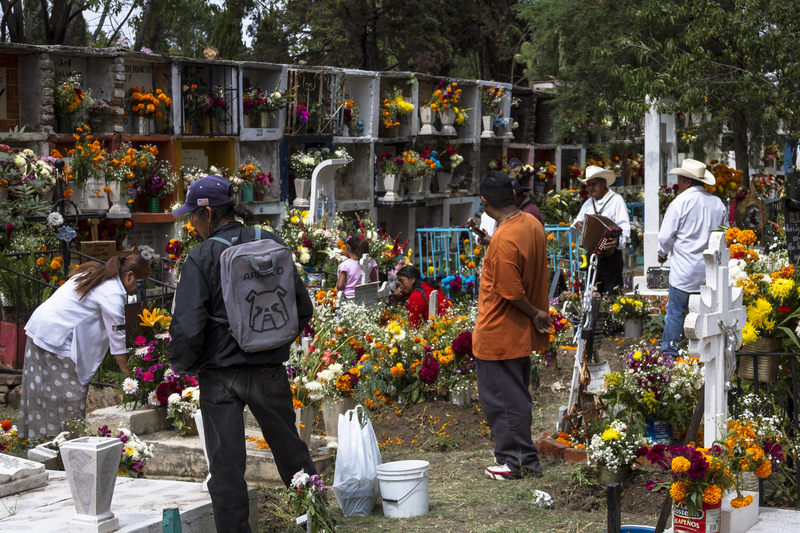 Even though the cemetery was nearly empty Saturday after being thronged Friday, I blundered upon a Ranchero band playing. A young widow was kneeling at the grave of her husband with their daughter at her side. I believe the man in the orange tee to be her brother. She had engaged the small band to play a set of Ranchero music for her man as she alternately prayed and spoke with him. Ranchero is one of those genres we associate with Mexico when we hear it even if we do not know the name. It is polka-like music. 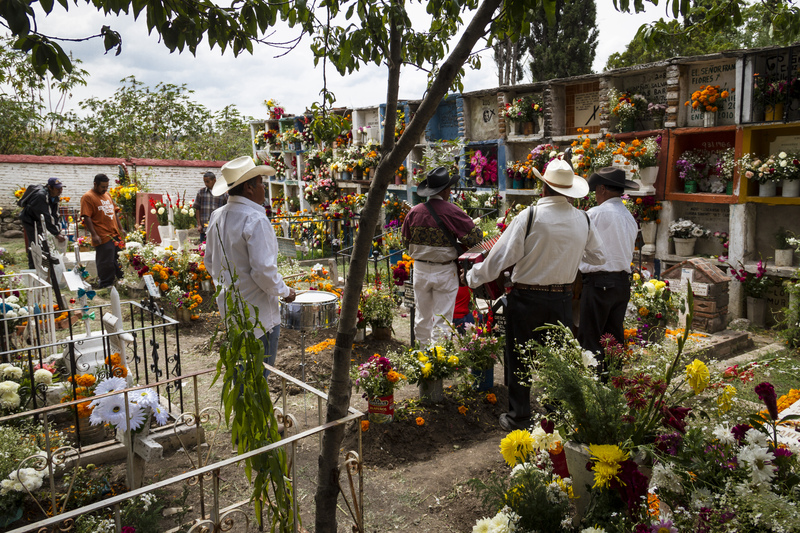 Even those Ranchero songs laden with sadness move along at a brisk pace. I certainly was not looking for something like this, but there I was. I could not leave at that point. I listened to the music and watched and waited and took these photographs to show you this. The camera can be an intrusive thing, but I kept firing it anyway without thinking too much about it. I do not believe that I disturbed anyone. When the set was done, nonetheless, I assuaged my guilt by paying the band for this set, con permiso of course. If you would like to see more photos, please click here to go to the other blog. How do you decide what goes on this blog and what goes on the other blog. In this case, they intersect. I'm reminded of the character of George on the old Seinfeld tv show, keeping "relationship George" separate from the other Georges. Good question, street. I like to keep them totally different. In this case I posted related entries because I thought this entry a little more deserving. At the other, newer blog I try to create the illusion there that I am a serious, arty person--a man of real substance. This blog has been in existence for three and a half years now. There are no more illusions here.